I don’t know about you, but the sun is shining strong at our house. Sure, we have a bit of start-of-the-day fog, but by mid-morning, our sky is free of any clouds and the sun holds its own high in the sky. The other day while we were outside playing, the tot left a crayon outside, resulting in a big melty mess for me to deal with later in the day. Crayons are mostly oil along with an itty-bit of color pigment mixed in. While I was slaving away cleaning that mess, I got an idea for a fun way to explore the wonders of melty crayons. Science and art really go hand-in-hand. They both often use the concept of experimentation and sometimes the result is unsure. Artists try new materials to create interesting artworks and scientists write out a hypothesis when testing theories. I figured we could do the same with this exciting summer art experiment. This is a great project for kids aged 6 and up. You may have to offer a helping hand at some points with the younger ones, but, for the most part, kids can use the basic materials to explore and create all on their own. Have your child go on a scavenger hunt searching out all those bits of crayons they aren’t interested in using anymore. Once she’s got a good pile, she can prep those crayons for the art experiment. Offer your child a grater and invite her to shave those crayon bits. She can keep the colors separate or make a big mongo pile of crayon shavings. Either way is totally okay. Grating those crayons helps hone your child’s fine motor skills, but also has the potential to grate little fingers. So, offer adult assistance as needed. Now get out a metal pie pan and line the bottom with a circle of white drawing paper. She can trace around a small plate or bowl and then cut along the line to create a circle that fits perfectly. 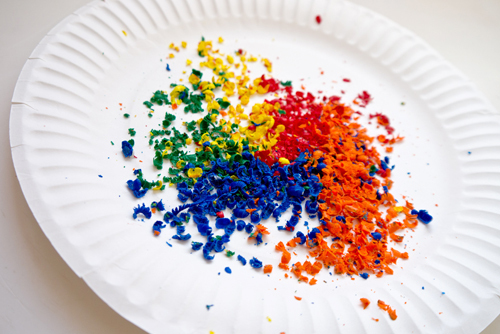 Once the round paper is in place, your child can sprinkle the crayon shavings around the paper. 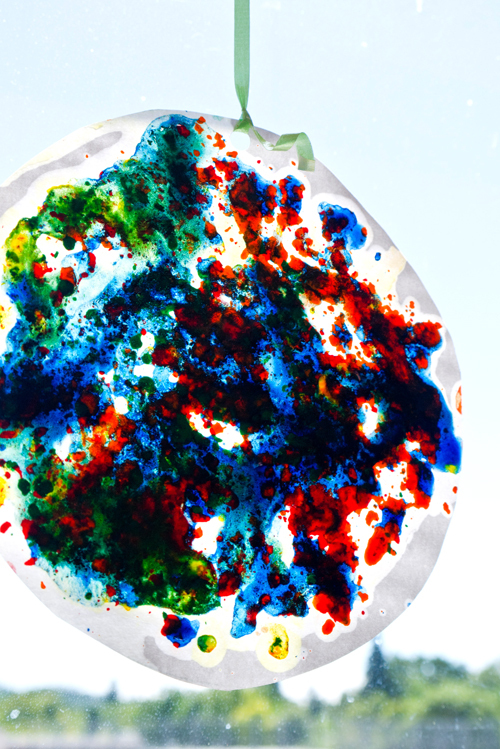 She can create a random color creation, or group those crayons shavings in a specific way. Place that pie pan in a nice hot spot where it will sit in the sun for an hour or so. Invite your child to create a chart using a sheet of scrap paper documenting increments of time and sections for writing results. She can also write out what she thinks might happen with her crayon shaving art experiment at the top of the paper. Invite your child to come back and check in with her crayon shavings every 10 minutes or so. What happens to the crayons? Is it what she expected? Encourage your child to write her notes on the cart and then hang her finished creation in a window for others to see. Now your child can take the experiment further by exploring what might happen if she uses different materials in the pie pan. Does the experiment work using a circle of tinfoil, waxed paper, or different colors of construction paper? How about if she drew with crayons on the paper instead of sprinkling the shavings? Invite her to try the experiment again but in a different way and see what happens. *Don’t have a nice summer sun? This activity can be done using a 200 F oven, too! Yes, your kids can make this.